According to the Tokyo VAAC a pilot observed an ash plume from Tori-shima drifting at an altitude of 2.1 km (7,000 ft) a.s.l. on 6 July. Vigorous ash plumes from Izu-Torishima (also Torishima) were noted during mid-August 2002 that reached an approximate altitude of 1.2-1.5 km (BGVN 27:07 and 27:10). The volcano apparently remained quiet until 6 July 2013, when a pilot observed an ash plume drifting about 74 km N of the volcano at an altitude of 2.1 km. However, the Tokyo Volcanic Ash Advisory Center did not detect ash in satellite images. The Japan Meteorological Agency (JMA) has no information about this uncertain activity available online. According to a news account quoting the JMA, a M 6.7 earthquake occurred near Izu-Torishima around 21 April 2013, but there is no evidence this event triggered any explosion. An eruption began at Tori-shima on 11 August and an aerial inspection by the Japan Coast Guard on 21 August revealed that "smoke" was no longer rising from the volcano as it had been on the 14th. Weak steaming was visible in the southern part of the crater. In addition, the sea surface around the island was faintly discolored. 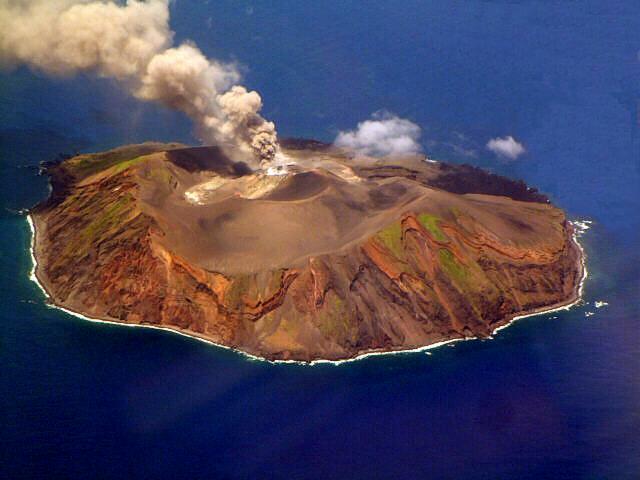 The eruption that began at Tori-shima on 11 August continued until at least noon on the 14th. Eruption clouds reached ~1.2 km a.s.l. on the 13th and ~1 km a.s.l. on the 14th. During observations on the 14th, scientists found smoke was being emitted from three areas on the western inner wall of the summit crater. 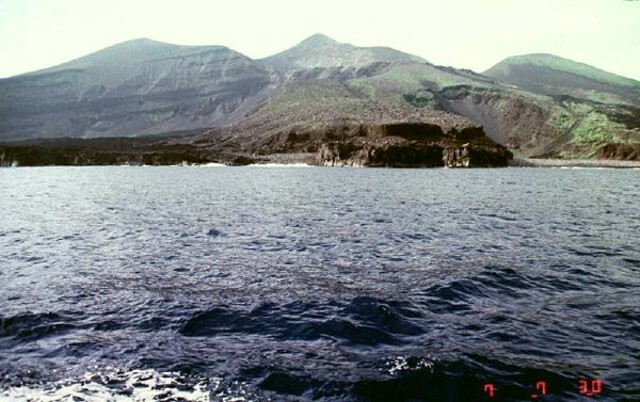 They also found that the crater seemed to have widened during the eruption and the sea surface was no longer discolored. On 11 August around 1530 a ship sailing near Tori-shima reported to the Japan Coast Guard that they observed white smoke rising from the summit of the volcano. JMA reported that an aerial inspection the following day during 1145-1245 revealed an ash-laden plume rising from the SW crater wall of the summit crater (Iwoyama) and white plumes emanating from the S to SE portion of the crater wall. Vigorous ash plumes rose 200-300 m above the crater every few minutes, drifted W, and ultimately reached a height of 1 km a.s.l. The summit area and the middle slope NNW of the summit were covered with ash-fall deposits. Discolored sea water extended 20 km W of the island. Tori-shima is not inhabited by humans, but an endangered albatross species lives there. Around 1530 on 11 August 2002, a ship sailing near Tori-shima reported white smoke rising from the summit of the island. The Japanese Coast Guard inspected the island from the air during 1738-1818 and confirmed that the plume was rising 200-300 m from near the summit crater (Iwo-yama). During an overflight on 12 August from 1145 to 1245 by the Japanese Meteorological Agency (JMA), an ash-laden plume was rising from the SW wall of the Iwo-yama summit crater. White plumes were also observed rising from the S to SE crater wall (figures 1 and 2). A vigorous ash plume rose 200-300 m above the crater every few minutes and drifted W to ~1 km above sea level. The summit area and the middle slope NNW of the summit were covered with ashfall deposits. The sea surface was discolored in an area up to 20 km W of the island. Izu-Tori-shima island is currently uninhabited. Figure 1. Photo showing the Iwo-yama crater of Tori-shima volcano, taken around 1200 on 12 August 2002. Courtesy JMA. Figure 2. Southern view of Tori-shima volcano showing ash plume from the summit crater, taken around 1200 on 12 August 2002. Courtesy JMA. Information Contacts: Tomonori Kannno and Hitoshi Yamasato, Japanese Meteorological Agency (JMA), Volcanological Division, 1-3-4 Ote-machi, Chiyoda-ku, Tokyo 100, Japan (URL: http://www.jma.go.jp/). Following ship-based reports of activity at Tori-shima on 11 August 2002, scientists from the Japanese Meterological Agency overflew the area the next day when they observed and photographed ash plumes being erupted from the crater (BGVN 27:07). According to the Japan Coast Guard (via JMA), the activity continued as of 1200 on 14 August; the plume reached ~1.2-1.5 km above sea level on 13 August (figure 3), and ~900 m on 14 August. Emissions were observed from three active areas along the western inner-wall of the summit crater. The crater appeared to have widened. By 21 August, the Japan Coast Guard reported that Izu-Tori-shima no longer "smoked" and only weak steaming was seen in the southern portion of the crater. Faintly discolored sea surface was observed around the island. Figure 3. Izu-Tori-Shima plume on 13 August 2002. Courtesy Air Force Weather Agency. Information Contacts: Tomonori Kannno and Hitoshi Yamasato, Japanese Meteorological Agency (JMA), Volcanological Division, 1-3-4 Ote-machi, Chiyoda-ku, Tokyo 100, Japan (URL: http://www.jma.go.jp/); Volcano Research Center (VRC), Earthquake Research Institute (ERI), University of Tokyo (URL: http://www.eri.u-tokyo.ac.jp/VRC/index_E.html); U.S. Air Force Weather Agency, Offutt AFB, NE 68113-4039, USA. The circular, 2.7-km-wide island of Izu-Torishima in the southern Izu Islands is capped by an unvegetated summit cone formed during an eruption in 1939. Fresh lava flows from this eruption form part of the northern coastline of the basaltic-to-dacitic edifice. The volcano is referred to as Izu-Torishima to distinguish it from the several other Japanese island volcanoes called Torishima ("Bird Island"). The main cone is truncated by a 1.5-km-wide caldera that contains two central cones, of which 394-m-high Ioyama is the highest. Historical eruptions have also occurred from flank vents near the north coast and offshore submarine vents. A 6-8 km wide submarine caldera lies immediately to the north. Sugimoto T, Ishibashi H, Matsushima T, 2005. Petrological study of Torishima volcani, Izu Islands, Japan. Bull Volc Soc Japan (Kazan), 50: 87-101 (in Japanese with English abs). There is no Deformation History data available for Izu-Torishima. There is no Emissions History data available for Izu-Torishima. An August 12, 2002 photo shows an ash plume rising from the summit crater of Tori-shima volcano. The unvegetated cone of Iwo-yama, seen here from the south, was constructed during an eruption in 1939 within a 1.5-km-wide caldera that truncates the eroded flanks of the volcano. The circular, 2.7-km-wide island of Tori-shima is located in the southern Izu Islands. The volcano is also referred to as Izu-Tori-shima to distinguish it from the several other Japanese island volcanoes called Tori-shima ("Bird Island"). Photo courtesy of Japan Meteorological Agency, 2002. The dark-colored lava flow along the coast in the foreground was emplaced during an eruption that began on 17 August 1939. A new cinder cone (Iwo-yama) was constructed in that year at the north end of the 1902 crater. Two lava flows reached the sea, the first at Hyogo-wan (the bay at the far right) and the second at Chitose Bay. Two people were killed during the eruption, which ended at the end of December. Large Eruptions of Izu-Torishima Information about large Quaternary eruptions (VEI >= 4) is cataloged in the Large Magnitude Explosive Volcanic Eruptions (LaMEVE) database of the Volcano Global Risk Identification and Analysis Project (VOGRIPA).